In 1 John the apostle John describes the nature of life in Christ in great detail and teaches us how to begin living the sort of life that God offers through Christ Jesus his Son. Chapter 2 goes in-depth and tells us how we must follow his commands in order to know him. This verse is pretty much a paraphrase of the idiom – Walk the Talk. 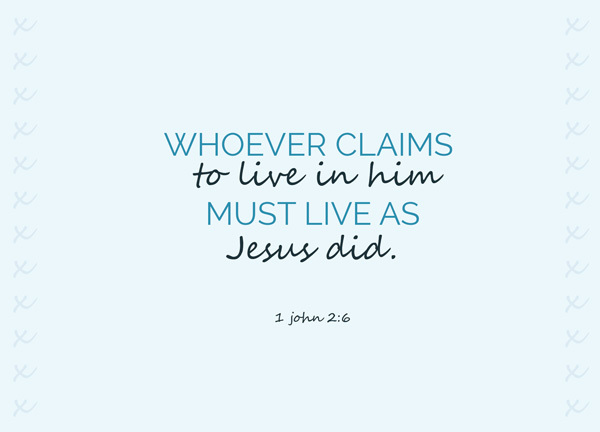 You claim that you live in Jesus? Good, but make sure you truly live in Jesus. Don’t just claim it. Make sure it’s true. Don’t be a liar. Don’t put the signboard of Christ when you’re really a gambling den. In this study we will examine how important it is that we walk our talk and how we can begin through the smallest things in life. Whoever claims – Just a few lines prior, John first addressed ‘whoever’ – Whoever says, “I know him,” but does not do what he commands is a liar, and the truth is not in that person [1 John 2:4]. Who is ‘whoever’? Anybody? Or any Christians? Are those who claim to live in Jesus but does not do what he commands – are those people Christians? Well, John called them liars, but are they lying Christians, or are they lying non-christians? It boils down to your definition of a Christian. What does being a Christian mean? You believe in Christ? You follow Christ? You obey Christ’s commands? You walk the way of life that Christ walked? We know the ‘criteria’ for salvation – to confess with your mouth and to believe with your heart. Whoever claims – that’s confessing with your mouth. That’s easy. That’s very black and white, too. Either you’ve said it, or you haven’t. But believing with your heart – how do you gauge that you truly believe? Do you know if you truly believe? The heart is deceitful above all things and beyond cure. Who can understand it? [Jer 17:9]. How would you know? We know by measuring ourselves against our actions. If you truly believe, you will act – The one who keeps God’s commands lives in him, and he in them. And this is how we know that he lives in us: We know it by the Spirit he gave us [1 John 3:24]. If you truly believe in God and love God, you will obey his commands and take the cross as your own. to live in him – This is not literal, obviously, but what does it mean? Cross-referencing other versions, there are terms rendered as ‘abide in him’. What’s abide? It’s to accept, submit, to act in accordance with. If you keep my commands, you will remain in my love, just as I have kept my Father’s commands and remain in his love [John 15:10]. must live as Jesus did – Honestly, it would be hard to live as Jesus did. How did Jesus live? The Bible tells us he lived in ignominy, was scorned in his hometown, associated with the poor and lonely, was mocked by the Pharisees and the authorities, was tempted by Satan himself and was persecuted, eventually prosecuted, rejected, and crucified. He preached, he healed the sick, he fed the thousands, he revived the dead, he overcame the verbal traps laid for him by the Pharisees. Honestly, it would be hard to literally live as Jesus did. Much of what he did that was listed in the Bible were things that he did as evidences of his deity and his identity as the Messiah, and we cannot pretend to imitate. But thankfully for us, Jesus taught aplenty and left us the Bible to guide us on how we should live. In the exercise of grace, of love, of peace, the Christ-like way. We probably won’t ever be crucified, and we may not even have the chance to die for God, but through the smallest, most mundane and everyday occurrences and happenings, we can choose to assert ourselves as Christians and live like Jesus did. You don’t have to accomplish anything ground-breaking to live as Jesus did. Indeed, Jesus was ground-breaking, he changed the lives of so many, and his legacy will never die. But we do not have to be internationally renowned in order to live as Jesus did. It is really through the smallest things, when nobody is looking, that our true character is tested and you’ll be able to tell if you have really believed in your heart that Jesus is Lord and God raised him from the dead. When you have truly followed God’s commands, even in the smallest things, even when dealing with your family behind closed doors, even in something that has become so routine to you, that is when we first begin to walk our talk and live as Christ did.